The long handle calico bag is our best selling bag. You can put your arm through the handles and carry it over your shoulder, so it's great for conferences, school library bags, and distributing promotional products. The calico they're manufactured with is specifically a high quality 140gsm fabric, and the stitching quality is a professional finish. With alot of cheaply produced calico bags on the market, we encourage customers to check they're comparing apples with apples. As a quality product, it's capable of carrying signfigant weight (eg. brochures/booklets/etc). 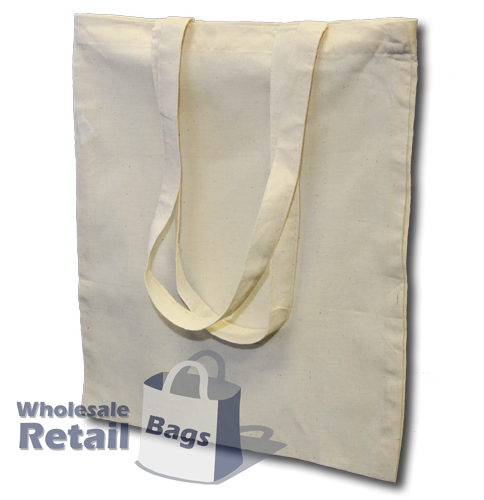 We also supply a short handle calico bag, which has the same fabric and stitching quality, just with a slightly shorter handle length.